In the mid '70s of the 20th century there arose a teaching within Charismatic circles that caused many to go astray in their understanding of the Word of God. As a result of this teaching, it became quite common to hear people say something to the effect of "God hasn't made that real to me yet." This would most often occur when trying to share a particular verse or concept from the Bible. That particular misuse does not, in and of itself, make the teaching wrong. However, it does highlight a key factor in the devaluation of the Bible in the modern church. The doctrine arose from the use of two Greek words in the New Testament translated in the King James Version as "word." Those two words are λόγος (logos) and ῥῆμα (rhema). Logos is said to be the written word and rhema is said to be the spoken word. This distinction came to mean that the words on the paper of the Bible are the logos, while the word that I hear in my spirit is the rhema. Or, more precisely, the rhema is that which the Holy Spirit makes real to me, or that word which is 'quickened' to me. In my experience, this is the basic understanding of the average Christian who uses these words. I often hear things like, "I want the rhema word," or "When we hear the rhema..."
Many of the teachers in the early Charismatic movement espoused this teaching, which they had heard mainly through Kenneth Hagin. He gained his understanding of the distinction and its importance from W.E. Vine, whose major contribution to the Body of Christ was his "Expository Dictionary of New Testament Words." Ephesians 6:17 uses rhema and is translated word. Vine's Expository Dictionary, first published in 1947, is a respected resource, and can be quoted without fear of contradiction in most any denomination or independent church. If you look closely at what I've presented so far, there is no discernible problem. I assume that most everyone is familiar with the old saw—"If NASA is off by one degree, the rocket will miss its target." It doesn't take much to miss something entirely. There are two things from the Dictionary quote that are worth pointing out. The first is the last clause after the emphasis: "...a prerequisite being the regular storing of the mind with Scripture." This is the basis which Mr. Vine establishes for the rhema to be able to work in a believer's life. 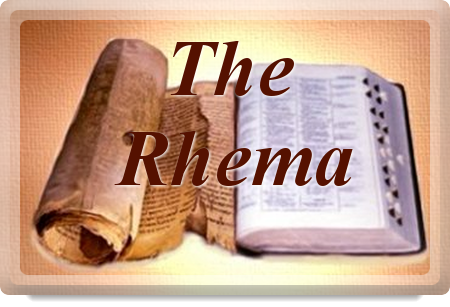 Without the solid foundation of the Word of God as revealed in the Bible, the so-called rhema could be nothing more than wishful thinking. I hear people pay lip-service to this concept all the time whenever they are going into any length about the rhema: "Of course, it has to line up with the Bible." In listening to them talk, though, it is obvious that the rhema carries much more weight with them than the written Word. Biblical illiteracy is at an all-time high, and many of those espousing their need for a "rhema word" would do well to get into the Bible for some serious reading. The Bible has become a moving target. One can strip it down, twist it, misread it, add to it, supplement it, and even overrule it, and, unfortunately, 95 percent of the congregation will not realize it." As the years have progressed and we have become further removed from the original teaching, the concept of rhema has degenerated from being the "sword of the Spirit for warfare" to "that which the Spirit brings to an individual." It is no longer a particular verse or a thought based on the Word, it is simply "that which the Spirit speaks to me." This fits right in with the spirit of the age in which we live where "it's all about ME." So far, about all you've been given here is opinion. In the next article, I will begin to show how the two words are used in the Bible so that we can see where the basis for this teaching lies.